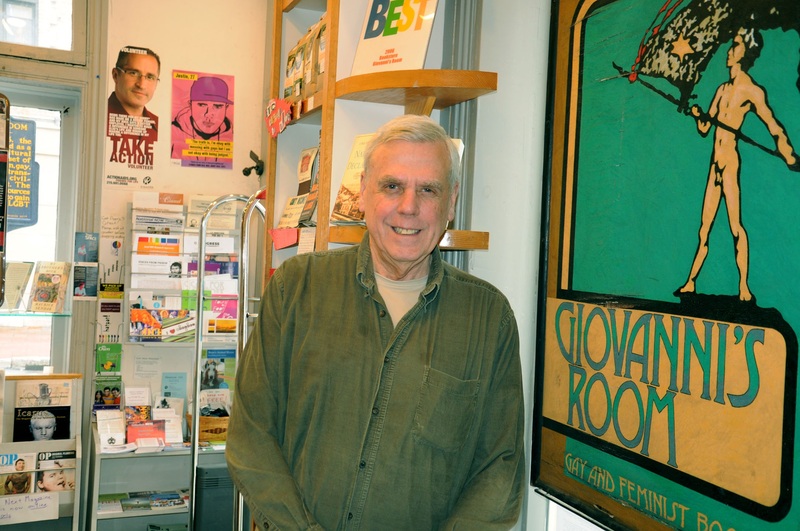 Buchhandlung Löwenherz congratulates Giovanni’s Room and its owner, Ed Hermance, on the occasion of the bookshop’s 40th anniversary, to be celebrated Saturday, October 5, 2013. It is now 2013 – 20 years ago in July 1993 the first gay and lesbian bookshop in Austria, Löwenherz, opened its doors in Vienna’s 9th district. But it isn’t and hasn’t been the first of its kind if you consider the whole Gay Planet. There were many others coming before us. They were models for Bookshop Löwenherz. One of them is Giovanni’s Room. We are walking in their footsteps. But many of our predecessors haven’t made it up to this day. Remember the A Different Light bookshops, or Oscar Wilde in the USA, remember Sodom, Lavendelschwert, Männertreu, Ganymed, or Max & Milian in Germany – just to mention a few. They have all provided LGBT literature plus pride stuff, CDs and DVDs to their communities. They were hotspots of LGBT culture with their readings and other events. They were offering workplaces for their LGBT personnel. 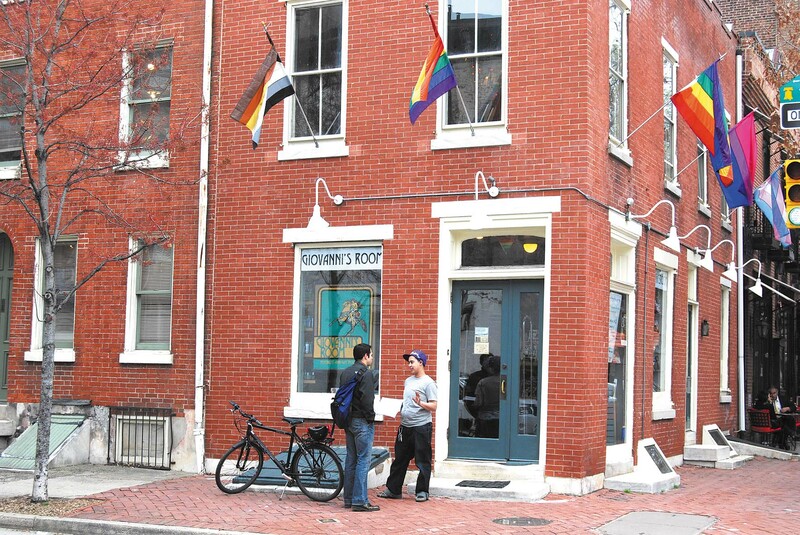 In the 1990s and early 2000s all of us LGBT bookshops were thriving over the globe. But now times have become hard for us. That’s why many have given up; why many had to close their doors forever. One of the early LGBT bookstores that is still in the business is Giovanni’s Room at the corner of South 12th Street and Pine Street in Philadelphia, Pennsylvania. This upcoming October it will be operating continuously for 40 years – at different locations though. This outstanding anniversary is cause enough for us to congratulate all who kept Giovanni’s Room going for such a long time. More than for anyone else this is due to its owner, Ed Hermance, who, at 73, is now understandably thinking about retiring soon. Ed wasn’t there from the beginning – he took over from the founders of the bookshop in 1976. But he has been the heart and soul of the bookshop ever since. He is a great bookseller and has become an institution in Philadelphia – for instance as the Grand Marshal of the Philly Pride. 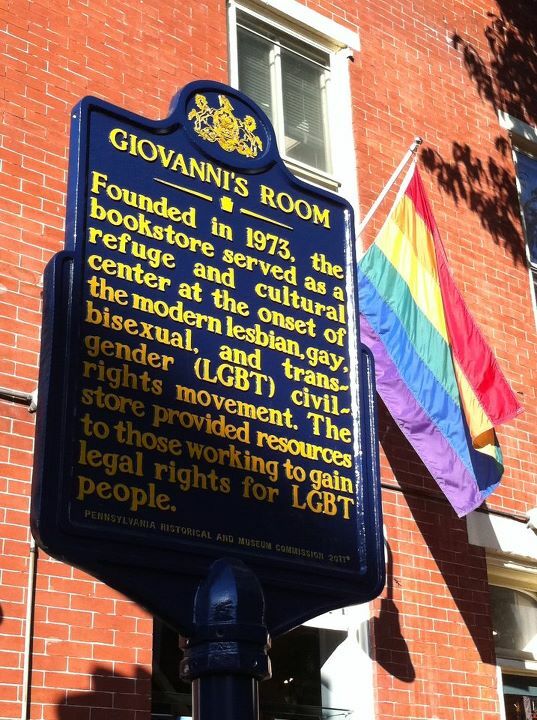 In October 1973, just a few years after the Stonewall Riots that sparked the second homosexual movement, the time was ripe for Philly to get its own gay and lesbian bookshop, Giovanni’s Room. Only few others like the Oscar Wilde Memorial Bookshop in New York (founded in 1968) were ahead of it. These were completely different times – there was no resilient or professional LGBT infrastructure in the bookselling business to build on; there was no Internet or other easy access to information about LGBT stuff; Ed told us that, at the beginning, there were only about 40 (sic!) LGBT titles Giovanni’s founders could start out with. When we opened Löwenherz 20 years later there must have already been about 3,000 titles available to fill our bookshelves – many of them in English; from the U.S. – supplied by Giovanni’s Room. And, now today, we have about 13,000 titles in, at least, three languages in stock. More come just about every day. In the beginning of the LGBT bookstores, relevant titles were hard to get unless the booksellers were doing detective work to dig out LGBT content, the homosexual authors, or homosexual interest of books. The canon of LGBT literature had to be constructed by the hard work of a generation of gay and lesbian booksellers. Many things had to be discovered. Publishers did not keep lists of titles they could sell to LGBT stores. They didn’t see a market. Neither did European book distributors. The LGBT bookshops were on their own. But they helped each other. This was their secret of success. It is in that spirit of co-operation the relation between Giovanni’s Room and Löwenherz began and prospered. The first time I heard of Giovanni’s Room was when I volunteered for one month at Munich’s gay bookshop Max & Milian in the summer of 1992. It was the year when construction work at Bookshop Löwenherz had begun, and I needed to get some practice in bookselling before I started work at Löwenherz, together with two partners, Andreas and Leo. I had finished my studies as a historian and sociologist at Hamburg University when I applied for the job as a bookseller at the project to establish the first gay bookshop in Vienna. I may have been a keen reader at the time, knew some gay books, but I hadn’t worked as a bookseller before and I had only a vague idea what titles should be found on the shelves of a gay bookshop and how such a shop should be run. That’s why I was sent to Munich to get a picture of the core stock titles of such a shop. And I should get an idea how Max & Milian was doing business. At that time, Giovanni’s Room was one of several distributors Max & Milian was using to get its U.S. and English books from. When I returned from Munich I made first contact with Giovanni’s Room. And at the end of 1992, there was a regular fax correspondence between Ed and me concerning our prosperous co-operation to come. From the Löwenherz side, it was mostly orders. We got long title lists from Ed and old editions of Books in Print – from which we chose the titles for our first orders for the opening stock of Löwenherz. We never gave it great thought but it was clear from the beginning we would get big chunks of U.S. gay and lesbian literature via Giovanni’s Room – especially those hard-to-get but indispensable books from small publishers, and most of our U.S. magazines. We took the information, the help for granted. Of course, we paid our bills. But there was so much help by Giovanni’s Room that you couldn’t find on any of its invoices. It was given for free by Ed just as a support of a community project that was so much like his own – but in another country like Austria, and equally fragile. So, from the beginning, Giovanni’s Room served for us as a distributor of US American books. Giovanni’s had to open wholesale accounts with major publishing houses and distributors as well as with small publishers in order to offer us GLBT bookshops in Europe, Australia, and Canada better discounts. The publishers and especially distributors often didn’t see the market. And from their perspective, they were right because some hundred thousand dollars every year may have been big money for Giovanni’s but not for them. So Giovanni’s Room filled this relevant gap at the crucial time and started this important transcontinental queer co-operation – going on between us up to the present. In September 1994, together with my boyfriend Martin, I had the chance to visit the USA and Canada. And on our way back to JFK, we made a detour to Philadelphia and paid Ed and his wonderful bookshop a visit for a few days. We stayed at his house. Ed was a very attentive and generous host. I remember the great breakfast in the garden behind his house. But he also showed us what we needed to see of gay Philly. He was the perfect guide. He also invited my boyfriend and me to the cinema – Priscilla, Queen of the Desert – what a nice surprise! Long before it premiered in Austria – we came to see this cinematic jewel. It was a sensation and a revelation alike. Thanks to Ed. 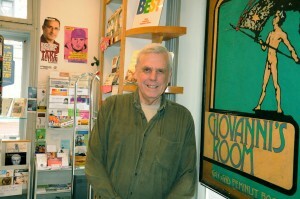 But most of all, I remember this marvel of a GLBT bookstore, that Ed called his own, Giovanni’s Room. It is situated not far from city center, City Hall in walking distance, a helpful mixed community around it, sitting at the corner of 12th and Pine Streets, a nice brick building, very welcoming. The location extends over four floors – not all are open to customers. The inside is filled with books and all the stuff that a LGBT heart may ever desire. But Giovanni’s Room didn’t create the supermarket flair of a chain bookstore. It made us feel at home. Think of the open fireplace on the second floor on which are displayed the recent, most recommended books for the customers. 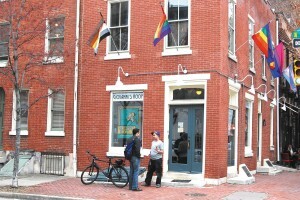 A chair stood beside the fireplace – adding to the cozy atmosphere so typical for Philadelphia’s GLBT bookshop. Anyone can easily imagine an author sitting there, reading from his new book. Big names have done just that – like Edmund White. I could imagine Ed sitting in the chair, doing an Xmas reading. But that was just my fantasy. I noticed people coming to Giovanni’s in order to get information about what was up in town; where to go out; what to see – a bookshop, hotspot of GLBT culture and tourist information center in one. Some were coming to get their ordered books – not necessarily LGBT literature. Others were looking over the shelves in order to find interesting new books. Others needed help with their choices. “Can you recommend this? Or, should I better take that?” Some were just looking. Most of the people coming to Giovanni’s were seemingly regular customers. But others were obviously coming from further away – perhaps the countryside or even the Midwest. At first, they seemed uncertain. But the situation in the shop was, over all, very inviting, friendly, amicable. It helped even those to relax who had just taken their first step into a GLBT location, festooned with rainbow flags on the outside and on prominent streets of Philadelphia – not on a shady backstreet. The staff at Giovanni’s Room were young, engaged, and friendly people – always there when you needed their advice. From my perspective, the store was in good shape and doing well. The shelves were full with fascinating things – some I knew from my own bookshop, others were absolutely new to me. I got some inspiration, too. Over all, the owner of Giovanni’s Room since 1976, Ed Hermance, as a gay bookseller of the early era, seemed to be so much ahead of me in experience. But he never let me feel it. When I met Ed I’ve always had the impression of us being equals – working to reach a common cause. In 1995, the year after I visited Philadelphia, Ed came to see Löwenherz. He was on a tour through Europe and stayed at my flat for some days. He visited the shop that was a one-year-old bookshop baby at the time. But he could see the youngster was walking in the footsteps of the older shops like Giovanni’s Rooms. We were still at the beginning of our co-operation – but during the 1990s and the early 2000s, it was really flourishing. Later on, distributors in Europe noticed their chances and began to supply American books and magazines to us – big time. So the stuff we needed from Giovanni’s , step by step, decreased. Compared to what we used to get from Giovanni’s in the beginning, the number of things may look small now but we still get shipments from Philadelphia from time to time – full of goods and information about new and forthcoming books. For us at Löwenherz, Giovanni’s Room was always a model of an LGBT bookshop. Its existence is tied to the history of the gay and lesbian movement. It served its local community and the Gay Planet with information, support, books and all. And, hopefully, it has got a future … if not it would leave a gap that would not only be felt in Philly but also at very distant parts of the Gay Planet. Now, at Giovanni’s turning 40 and at the eve of Ed retiring, I want to thank Ed and Giovanni’s Room for all they did for us, for the good and prosperous co-operation we had in twenty years. I would like to bring out a toast for the next twenty years, or, as Ed put it in his greetings for our 20th anniversary in July: »I hope the two stores will find uses for each other forever.« We all, on this and the other side of the ocean, would wish that this will come true. These are hard times for all booksellers. Many of us – gay, lesbian, feminist – had to give up already and close shop. We would love to see Giovanni’s Room have a splendid and prosperous future. It’s understandable that after nearly 40 years of serving the LGBT community – not only in Philadelphia – and at an age when others have long retired Ed Hermance wants to enjoy his own retirement. 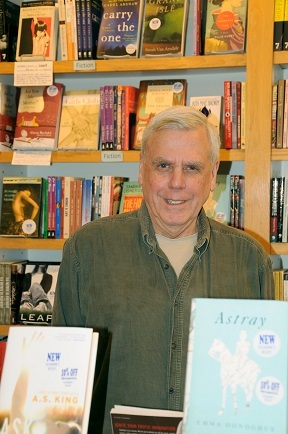 We, the guys of Löwenherz, would love to see him be healthy for many more years to come – even if he will no longer be selling books at the community bookshop at South 12th Street and Pine Street. He will, in any case, stand for forty years of Giovanni’s Room – with all its achievements and memories. Congratulations to Giovanni’s Room and to Ed Hermance – well done, boys and girls – and go on. Buchhandlung Löwenherz gratuliert Giovanni’s Room und seinem Besitzer Ed Hermance aus Anlass des 40. Jahrestages der Eröffnung der Buchhandlung – dieser wird am Samstag, den 5. Oktober 2013 gefeiert. Wir haben das Jahr 2013 – vor 20 Jahren im Juli 1993 öffnete der erste schwule und lesbische Buchladen Österreichs – Löwenherz – im 9. Wiener Gemeindebezirk seine Pforten. Aber Löwenherz ist weder noch war es die erste Buchhandlung ihrer Art – wenn man den ganzen Gay Planet heranzieht. Es sind schon viele vor uns da gewesen. Sie waren die Vorbilder für die Buchhandlung Löwenherz. Eines davon ist Giovanni’s Room. Wir bewegen uns in ihrer aller Fußstapfen. Aber viele unserer Vorgänger haben es nicht bis zum heutigen Tag geschafft. Erinnert euch an die »Different Light« Bookshops oder Oscar Wilde in den USA, erinnert euch an Sodom, Lavendelschwert, Männertreu, Ganymed oder Max & Milian in Deutschland – um nur ein paar namentlich zu erwähnen. Sie alle haben ihre Communities mit LGBT-Literatur, all den Pride Artikeln, CDs und DVDs versorgt. Sie waren Zentren des LGBT-Kulturlebens mit ihren Lesungen und anderen Events. Sie boten ihren schwullesbischen Mitarbeitern Arbeitsplätze. In den 1990ern und den frühen 2000ern blühten die LGBT-Läden überall auf dem Globus mächtig auf. Doch nun sind die Zeiten für uns alle härter geworden. Das ist der Grund, warum viele von uns aufgegeben haben; warum viele ihre Pforten für immer schließen mussten. Einer der ersten schwullesbischen Buchläden, der noch immer im Geschäft ist, befindet sich mit Giovanni’s Room an der Ecke South 12th Street und Pine Street in Philadelphia, Pennsylvania. Im anstehenden Oktober wird der Laden seit 40 Jahren ununterbrochen als LGBT-Projekt betrieben – wenn auch an verschiedenen Orten. Dieser herausragende Jahrestag ist für uns Grund genug allen zu gratulieren, die Giovanni’s Room für so lange Zeit am Laufen gehalten haben. Niemanden ist das mehr zu verdanken als Ed Hermance, der nun mit 73 Jahren verständlicherweise darüber nachdenkt, sich in den verdienten Ruhestand zu begeben. Ed war nicht von Anfang an dabei. Er übernahm den Laden von seinen Gründern im Jahr 1976. Doch von da an war er Herz und Seele des Ladens – bis heute. Er ist ein großartiger Buchhändler und ist zu einer Institution in Philadelphia geworden – zum Beispiel fungierte er schon als Großmarschall beim Philly Pride. Im Oktober 1973 – nur ein paar Jahre, nachdem mit den Stonewall Riots die zweite Homosexuellenbewegung entstanden war – war die Zeit reif für Philadelphia seinen eigenen Schwulen- und Lesbenbuchladen zu bekommen – Giovanni’s Room. Nur wenige andere wie der Oscar Wilde Memorial Bookshop in New York (gegründet 1968) gingen ihm voraus. Das waren völlig andere Zeiten. Es gab noch keine belastbare oder professionelle LGBT-Infrastruktur, auf die sich der einschlägige Buchhandel hätte stützen können. Es gab noch kein Internet oder einen anderen unkomplizierten Zugang zu Informationen über die schwullesbischen Dinge. Ed erzählte uns einmal, dass es am Anfang nur etwa 40 einschlägige Titel gegeben hätte, mit denen die Gründer von Giovanni’s Room das Geschäft aufgesperrt hätten. Als wir 20 Jahre später mit Löwenherz begannen, waren es immerhin schon etwa 3.000 lieferbare Titel, mit denen wir unsere Regale füllen konnten – viele davon waren in englischer Sprache – und die aus den USA waren uns zu einem Großteil von Giovanni’s Room geliefert worden. Zum heutigen Zeitpunkt sind es etwa 13.000 Titel, die wir auf Lager haben. Es werden täglich mehr. In der Anfangsphase der LGBT-Buchläden waren einschlägige Titel nur unter Einsatz des detektivischen Gespürs der Buchhändler eruierbar. Sie stießen auf den schwullesbischen Inhalt, die homosexuelle Natur der Autoren oder die LGBT-Relevanz der Bücher. Der Kanon der LGBT-Literatur musste erst noch aufgestellt werden durch die fleißige Arbeit einer ganzen Generation schwuler und lesbischer BuchhändlerInnen der ersten Stunde. Vieles musste erst mühselig ausgebuddelt werden. Verlage hielten keine Listen mit Titeln bereit, die sie den LGBT-Läden hätten anbieten können. In den Lesben, Schwulen, Bisexuellen und Transgenderpersonen erkannten sie noch lange keinen nennenswerten Markt. Dasselbe gilt für europäische Auslieferer. Die schwullesbischen Buchläden waren auf sich selbst gestellt. Aber sie halfen einander. Das war das Geheimnis ihres Erfolges. In diesem Geist begannen Giovanni’s Room und Löwenherz 1993 ihre Zusammenarbeit. Sie sollte Bestand haben und prosperieren. Das erste Mal, dass ich von Giovanni’s Room gehört habe, war, als ich im Sommer 1992 bei der schwulen Buchhandlung Max & Milian in München ein einmonatiges Volontariat absolvierte. Es war das Jahr, in dem die Bauarbeiten für die Buchhandlung Löwenherz bereits begonnen hatten. Ich brauchte etwas Praxis im Buchhandel, bevor es mit dem eignen Laden in Wien losgehen sollte. Zusammen mit meinen Kollegen Andreas und Leo hatten wir die Vorarbeiten schon recht weit vorangetrieben. Ich war gerade fertig geworden mit meinem Geschichte- und Soziologiestudium an der Universität Hamburg, als ich mich für den Job eines Buchhändlers bei Löwenherz bewarb – es war das Projekt, das die erste schwule Buchhandlung in Wien auf die Beine stellen sollte. Damals war ich ein begieriger Leser, kannte auch schon einige schwule Bücher, aber als Buchhändler hatte ich bis dahin noch nicht gearbeitet. Ich hatte nur eine vage Idee davon, welche Titel man in den Regalen einer schwulen Buchhandlung vorfinden sollte und wie man einen solchen Laden betreibt. Das war der Grund, weshalb ich nach München geschickt wurde – um einen Überblick über die hauptsächlichen Lagertitel eines solchen Ladens zu gewinnen. Außerdem sollte ich eine Idee davon bekommen, wie die Jungs von Max & Milian ihr Geschäft betrieben. Zum damaligen Zeitpunkt war Giovanni’s Room einer von mehreren Lieferanten in den US, von denen Max & Milian seine englischen Bücher bezogen hat. Als ich aus München zurückkam, stellte ich bald unseren ersten Kontakt zu Giovanni’s Room her. Am Ende des Jahres 1992 gab es bereits regelmäßigen Faxverkehr zwischen Ed und mir – es bahnte sich eine blühende Zusammenarbeit an. Von unserer Seite kamen vor allem Bestellungen. Ed hatte uns bald lange Titellisten und ausgediente Book-in-Print-Wälzer geschickt – aus ihnen wählten wir unsere ersten Bestellungen aus – die ein wichtiger Teil des Sortiments wurden, mit dem wir Löwenherz aufsperrten. Nie haben wir groß darüber nachgedacht – denn irgendwie war von Anfang an klar, dass wir in großen Teilen die schwule und lesbische Literatur aus den USA über Giovanni’s Room beziehen würden – im besonderen die schwer zu bekommenden, aber nichtsdestoweniger unerlässlichen Bücher von Kleinverlagen – darüber hinaus die meisten unserer US-Zeitschriften. Wir haben die Information und die Unterstützung für selbstverständlich genommen. Natürlich haben wir unsere Rechnungen bezahlt. Aber tatsächlich gab es eine Menge Unterstützung von Seiten von Giovanni’s Room, die sich in keiner seiner Rechnungen niederschlug. Wir bekamen das von Ed geschenkt – es war als Unterstützung eines Communityprojekts gedacht, das seinem eigenen sehr ähnelte – auch wenn es sich in einem anderen Land wie Österreich befand, aber gleichermaßen fragil war wie sein eigenes. Und so übernahm Giovanni’s Room für uns von Anfang an die Funktion eines Lieferanten für US-Bücher. Zu diesem Zweck hatte Giovanni’s Großhändlerkonten bei wichtigen Verlagshäusern, Auslieferern und Kleinverlagen einrichten müssen. Nur so konnten sie uns – den LGBT-Läden in Europa, Australien und Kanada – bessere Konditionen einräumen. Die Verlage ebenso wie die Lieferanten sahen in uns keinen lohnenden Markt. Und aus ihrer Perspektive lagen sie nicht einmal falsch – es ging um einige hunderttausend Dollar jedes Jahr – was für Giovanni’s Room eine Menge Geld darstellte – aber nicht für sie. Darum füllte Giovanni’s Room für viele Jahre diese bedeutende Lücke zu einer entscheidenden Zeit aus und begann mit dieser wichtigen transkontinentalen queeren Kooperation. Sie riss bis heute nicht ab. Im September 1994 nutzten mein Boyfriend Martin und ich einen kleinen Abstecher auf unserem Rückweg von Kanada zum Flughafen JFK, um Ed und seinem wundervollen Buchladen in Philly für ein paar Tage einen Besuch abzustatten. Wir übernachteten in seinem Haus. Ed war ein sehr aufmerksamer und großzügiger Gastgeber. Ich erinnere mich an ein großartiges Frühstück im Garten hinter seinem Haus. Er zeigt uns aber auch alles, was man vom schwulen Philadelphia gesehen haben musste. Er war der perfekte Fremdenführer. Auf seinen Vorschlag hin gingen wir auch ins Kino, um den Film »Priscilla – Königin der Wüste« anzuschauen – eine schöne Überraschung. Das war eine Weile, bevor der Film überhaupt in Österreich anlief. Wir durften dieses cineastische Juwel schon damals sehen. Es war eine echte Sensation und Augen öffnend zugleich. Danke Ed! Mehr als an alles Andere erinnere ich mich gern an dieses Juwel eines LGBT-Buchladens, das Ed sein Eigen nennt: Giovanni’s Room. Der Laden befindet sich nicht weit entfernt vom Stadtzentrum Philadelphias, das Rathaus in Gehweite, eine gern helfende, gemischte Community um ihn herum, genau am Eck von 12th und Pine Street, ein anheimelnder Backsteinbau, sehr einladend. Das Geschäft erstreckt sich über vier Stockwerke, von denen allerdings nicht alle für das Publikum zugänglich sind. Das Innere des Ladens ist angefüllt mit Büchern und all den Dingen, die das queere Herz jemals begehren könnte. Doch Giovanni’s Room strömte das ganze Gegenteil des Supermarktflairs einer Handelskette aus. Wir konnten uns wie zuhause fühlen. Denkt nur an den offenen Kamin im 2. Stock, auf dem für die Kunden die aktuellen Buchempfehlungen der Buchhändler ausgestellt wurden. Ein Sessel lud neben dem Kamin zum Verweilen ein und trug zur behaglichen Atmosphäre ein, die Philadephias LGBT-Buchladen prägt. Jeder kann sich leicht vorstellen, wie es ist, wenn ein Autor dort sitzt und aus seinem neuen Buch vorliest. Große Namen haben genau das getan – wie zum Beispiel Edmund White. Ich hätte mir auch gut Ed in dem Sessel sitzend vorstellen können – für eine Weihnachtslesung. Aber das ist bloß eine Fantasie von mir. Mir fielen Leute auf, die extra zu Giovanni’s Room kamen, um Infos einzuholen, was den gerade los wäre in der Stadt; wo man gut ausgehen konnte; was es Sehenswertes gäbe – eine Buchhandlung, eine Epizentrum der LGBT-Kultur und ein Tourismuszentrum in einem. Einige kamen herein, um bestellte Bücher abzuholen – nicht notwendigerweise schwul oder lesbisch. Andere stöberten in den Regalen nach neuen, interessanten Büchern. Andere brauchten Hilfe bei der Auswahl. »Ist das empfehlenswert? Oder sollte ich doch besser dieses Buch nehmen?« Manche kamen nur, um zu schauen. Die meisten Leute, die zu Giovanni’s Room kamen, waren anscheinend Stammkunden. Doch andere schienen von weiter her zu kommen – vielleicht vom Land oder gar aus dem Mittleren Westen. Anfangs machte diese Leute einen unschlüssigen Eindruck. Aber die Atmosphäre in dem Laden war einfach sehr einladend, freundlich, fast freundschaftlich. Es half ihnen, die Aufregung abzulegen – auch wenn es vielleicht das erste Mal war, dass sie eine LGBT-Lokalität betreten haben – ganz offen mit Regenbogenflaggen geschmückt und nicht an irgendeiner Seitenstraße befindlich – sondern am Eck zweier prominenter Straßen Philadelphias. Das Personal bei Giovanni’s Room war überwiegend jung, engagiert und freundlich – immer zur Stelle, wenn man sichtlich Rat brauchte. Aus meiner Perspektive war der Laden tipptopp in Form und florierte. Die Regale waren voller faszinierender Dinge – einige davon kannte ich schon aus der eigenen Buchhandlung, andere waren noch neu für mich. Dort holte ich mir Inspiration. Ed Hermance, der Besitzer von Giovanni’s Room seit 1976, erschien mir als schwuler Buchhändler der ersten Stunde so weit voraus in seiner Erfahrung. Und doch ließ er es mich nicht spüren. Als ich Ed traf, hatte ich stets den Eindruck, mit ihm auf gleicher Stufe zu stehen – ausgerichtet auf das gemeinsame Ziel. 1995 – ein Jahr nach meinem Besuch in Philadelphia – kam Ed zu uns auf Gegenbesuch. Er befand sich auf einer Reise durch Europa und wohnte für ein paar Tage bei mir daheim. Natürlich kam er auch in die Buchhandlung, die damals noch ein einjähriges Buchladenbaby war. Doch ihm konnte klar sein, dass der Benjamin unter den schwullesbischen Buchläden in die Fußstapfen der älteren treten würde. Wir waren noch am Anfang unserer Kooperation. In den 1990ern und den frühen 2000ern begann sie richtig zu florieren. Später entdeckten jedoch europäische Lieferanten ihre Chancen und begannen nach und nach mit dem Vertrieb einschlägiger amerikanischer Bücher und Zeitschriften – irgendwann sogar im großen Stil. Und so schmolz der Bedarf an Lieferungen von Giovanni’s Room nach und nach dahin. Gemessen an der Menge an Dingen, die wir früher von Giovanni’s Room geliefert bekamen, ist es heute wenig. Doch auch heute erreichen uns noch Pakete aus Philadelphia von Zeit zu Zeit – voll mit Informationsmaterial über neue oder erst noch erscheinende Bücher und mit Ware. Für uns Löwenherzen war Giovanni’s Room immer ein Vorbild. So sollte ein LGBT-Laden ausschauen. Sein Dasein ist untrennbar mit der Geschichte der schwullesbischen Bewegung verknüpft. Der Laden hat seine Community vor Ort ebenso wie den ganzen Gay Planet mit Informationen, Unterstützung, Büchern und allem versorgt. Und hoffentlich hat er auch eine Zukunft. Falls nicht, würde die Lücke, die sein Fehlen reißen würde, nicht nur in Philly spürbar sein, sondern auch an weit entfernten Orten des Gay Planet wie Wien. Nun – nachdem Giovanni’s Room 40 wird und Ed daran denkt aufzuhören – möchte ich die Gelegenheit ergreifen, um Ed und Giovanni’s Room für all das danken, das sie in den vergangenen 20 Jahren für uns getan haben. Ich möchte einen Toast ausbringen auf die nächsten 20 Jahre, die unter dem Motto stehen mögen, das Ed in seinem Jubiläumsgruß ausgesprochen hat: »Ich hoffe, die beiden Läden werden für immer nützlich füreinander sein.« Wir alle – diesseits und jenseits des Ozeans – würden wünschen, dass dieser Fall eintritt. Es sind harte Zeiten für alle Buchhändler. Viele von uns – schwul, lesbisch, feministisch – haben bereits aufgegeben und wieder geschlossen. Wir würden gerne Giovanni’s Room in der Zukunft blühen und erstrahlen sehen. Es ist verständlich, dass Ed Hermance jetzt – nachdem er vierzig Jahre lang der LGBT-Community gedient hat – seine Pension genießen will. Wir – die Jungs von Löwenherz – möchten ihn gern noch viele Jahre lang in bester Gesundheit erleben. Auch wenn er nicht mehr länger seinem Beruf nachgehen wird, im Community-Bookshop Ecke South 12th Street und Pine Street Bücher zu verkaufen, wird er dennoch für 40 Jahre Giovanni’s Room stehen – mit all seinen Errungenschaften und Erinnerungen. Gratulation an Giovanni’s Room und Ed Hermance – gut gemacht, Boys und Girls! Und: weiter so! Dieser Beitrag wurde unter Buchhandel abgelegt am 1. Oktober 2013 von Buchhandlung Löwenherz.